At first I did it with an ax – thin, slight but with weight, sharp, and with a solid easy-swing handle oiled and darkened from relentless swinging. This technique worked, but usually with a great deal of extra effort after the blow. After the blow would come the wrestling and the knees on the ground, reluctant reverence. I would be summoned for dangerous yanking, twists, back and forth swinging, and, if this didn’t work, hits and smashes to literally sledge hammer my beloved ax out or through. My little naughty adversary and all of his family tree would take my over-the-head strength with this long, thin axhead, accept it with silence, and hold tight. The dumb silence of this interaction can really get to you. Often enough, I repeatedly made a new, quite useless sledgehammer with a huge 33 cm long wooden mallet head. It is not smart to swing around very insecure, large pieces of wood on the end of a stick in the air and over the head. But this is what you have to do when you are like me, a city fool, and haven’t been made aware of only the most unchanged technology since the Stone Age. Split wood burns more easily. The water comes out of it and it seasons better in the air. 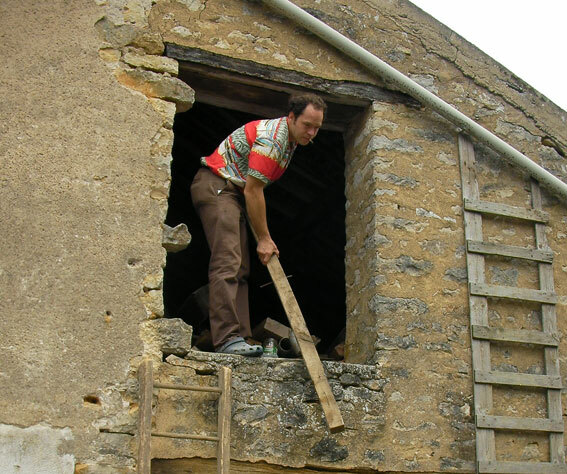 When we received five steres (one cubic meter) of soaking wood in the rain, sometimes in lengths which were really too wide to handle properly next to the glass woodstove door, or simply too big for it, splitting was necessary. I didn’t mind. I liked directly contributing to the warmth of my house, of my family. I can’t burn checks or cash for warmth, but wood is the next best thing. Our woodcutter, Claude, a short, stocky, happy man who wears a baseball cap and checkered flannel shirts (playing the part) and who is often covered in wood shaving and dust, gets 95% percent of the credit for warming our house and our lives, but I’ve convinced myself that the extra 5% of my effort is what really makes us warm. Claude gets to go out to the woods every day (he works 7/7, a French rarity) and cut down the trees, section the wood into one-meter-long manageable blocks, haul these blocks out of the woods to a workable, rough carpenter’s plot, then use a hydraulic log splitter (imagine a well centered guillotine with a wider blade) to smack the meter lengths into wood that he then cuts into thirds, throws in the bed of his truck, drives to my driveway and, using a hydraulic bed, dumps. I split what needs splitting, then put these maybe 400 sections of wood away from the rain before hauling them little by little into the house to burn. Pure satisfaction. Except for the splitting. One day, I was looking after my daughter by making her sit away from me and my swinging on a wide short stool of wood. The neighbor next door had paid a man to come with a large truck and empty her house for her before selling it (I don’t think her selling had anything to do with us). The man, Bogdad or something like that, had obviously watched me wrestle my ax from a length of wood. He came over and said that I was doing it all wrong, that I wasn’t supposed to use an ax but a burin. I didn’t know what this was and, after having lived in France for a while, was numb to hearing that I wasn’t doing something right. We talked about it (the wood, the ax, the burin – whatever the hell that was) and he offered to give me one. I accepted this kindness, but didn’t know what he meant, to tell you the truth; did that mean that I would have to go to his antique store and ask about it, probably buy one (though I understood that he would ‘give’ me one), and deal with all of this at a time when I was on my hands and knees trying not to cut my knee off and get my goddamned ax out of a piece of wood while my daughter looked at me perplexed and a little condescendingly (Dada playing with blocks of wood)? I didn’t know where it would end, this ‘burin’ story. Yet, the man returned later that day with a burin, handed it to me, and got back in his truck, wishing me ‘bon courage’. The burin was an old, much heavier, thicker, duller, broader ax head with a good, thick rod of a handle, very different from my slight ax with the thin, well shaped handle. At its extremity, the width was about 10 cm across – pretty wide. As a boy-man, man-boy who enjoys swinging around extremely dangerous tools, I was excited and immediately tried it out. Not only did wood split along the cut; it split with relative ease. I no longer had to throw all of my weight into it and try to split the earth along with the log length, but a simple head-height blow would suffice to split the wood. After so many months of frustratingly whacking at wood lengths, only to have many of them hold me down under their strength, I had become the dominant splitter in this game. I could split wood. Now equipped with the burin, my son often comes out and balances the logs for me before I deal my blow. He wants to swing, but it’s too heavy for him and I don’t want him to split his foot open. Dealing with the wood now gives me more pleasure than ever; I can successfully aim the burin and split two centimeter wide hairs of wood – excellent for starting a fire. When I come home from working in front of a computer and a classroom, splitting wood is one of my most cherished activities. It even requires little effort, though it still looks impressive to my son. When I have the time, I will go through all of the steps involved in directly contributing to one of the three vital needs of man – warmth. It could seem unsettling to cut down a tree because of our consciousness of ‘tree huggers’, Honest Abe and the cherry tree, and ecologists and scientists telling us that the cutting of the rainforests will ultimately destroy the balance of hydrogen and oxygen. I don’t doubt it. But to warm our house, we don’t use coal, gas, or nuclear energy. We burn royal oak, clear birch (hornbeam), and rich chestnut. Time will definitely be what I need for cutting down trees for my own heat, however, because contrary to the lessons learned about the expediency of the wide burin blade versus the thin snicker snack of an ax blade, in no way would I adopt the chainsaw. I can’t have a flying blade get stuck, and start yanking at it. My ax, the initial companion, would be just fine for chopping. Buster Burk is a woodsman and scholar, a poet and a father. He splits his time between Burgundy where he is restoring a 17th century farmhouse and Paris where he teaches English and completes his doctorate in literature at the Sorbonne. This entry was posted in Interesting, Reflections from elsewhere, Useful. Bookmark the permalink. That boy of yours — he’s not just gazing impressed at you. He’s performing acts of axinomancy! axinomancy [ORIGIN Latin axinomantia from Greek axinomanteia, from axinē axe: see -mancy.] Divination by means of an axe head. Deep satisfaction in the splitting of wood. I grew up in the mountains of Northern California where we burned 6 truckloads of wood a year to heat a rambling house. Splitting large piles of wood was good work for us horny, stinky, frustrated and energetic teenagers. But just like shoveling wet snow – while I still enjoy it in passing – I don’t miss it as a daily chore. Thought of a story about a friend who tried to jam a too-long piece of wood into his raging woodstove on a blowing, snowy night. He couldn’t close the door of the stove or extract the round – had to fire up the chainsaw in his living room, and cut the end off of the burning piece as to be able to close the door. It’s crazy that you caught up with me through this old essay! My good friends keep up this website and sent word about your trying to get back in touch – and with photos to boot! Please send me an email so that this conversation can continue more directly – but it’s very interesting indeed to hear from you! How are you? How’s Texas? I’m informing my father of your call to get in touch so that we can all enjoy the reunion – at least virtual for the moment!